The belief held by Aboriginal people that their art is ultimately related to their identity, and to the continued existence of their culture, has made the protection of indigenous peoples' art a pressing matter in many postcolonial countries. The issue has prompted calls for stronger copyright legislation to protect Aboriginal art. Although this claim is not particular to Australian Aboriginal people, the Australian experience clearly illustrates this debate. In this work, Elizabeth Burns Coleman analyses art from an Australian Aboriginal community to interpret Aboriginal claims about the relationship between their art, identity and culture, and how the art should be protected in law. Through her study of Yolngu art, Coleman finds Aboriginal claims to be substantially true. This is an issue equally relevant to North American debates about the appropriation of indigenous art, and the book additionally engages with this literature. 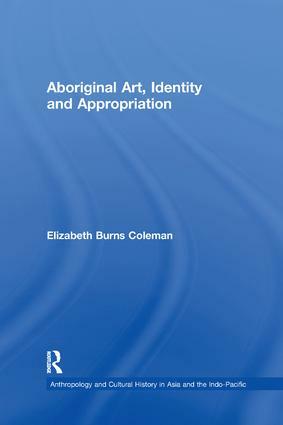 Contents: Series Editors' preface; Mapping the problem; Cultural appropriation; Culture and property; Domestic questions; Identity and images; Religion and significance; Art fraud and the ontology of painting; Applying the criteria for authenticity; Insignia and collective entities; Cultural vandalism; Interpreting Aboriginal claims as rights; Freedom of expression and insignia; Responding to Aboriginal claims; Bibliography; Index. Elizabeth Burns Coleman lectures in Moral and Political Philosophy at La Trobe University, Australia. She has held a postdoctoral fellowship at the Australian National University's Centre for Cross Cultural Research. She has lectured in aesthetics at the Australian National University, and published articles on cross cultural aesthetics and the ethical and political aspects of art, including appropriation, forgery, the use of nom de plume, and plagiarism.